Pallets travel the world carrying all types of products. They hold the power to make or break a company’s profits. While the choice of which pallet to use may seem straightforward, custom pallets offer several advantages. Do delivery specifications require two or four way entry? Will plastic or wood best support the load? Which type of wood proves best suited for the weight of the product? What size or dimensions best protect your shipment? Are heat treated materials required? What type of pallet fasteners (i.e. nails) increase load reliability? Custom built pallets allow you to specify the materials that meet your product load’s needs. Not too much. Not too little. 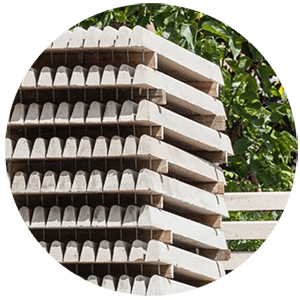 Plus, options exists to design brand new pallets or reuse and recycle old skids to conform to your specifications. Several reasons exist to choose custom designed skids. These advantages may just sell you on the purchase of these products for your shipping needs. Pallets provide the foundation of your shipping department both literally and figuratively. In other words, these wood or plastic platforms support your product in order to ensure safe and efficient delivery to the customer. The material and construction of these skids significantly impacts a number of factors throughout the process. Quality pallets save loading and unloading time, offer greater safety, and protect product quality. Additionally, distribution and delivery slowdowns occur with pallet designs not tailored to a customer’s storage and retrieval systems. Finally, companies with unique needs or product specifications may fail to find the ideal pallet to carry their goods. Custom pallets support a smooth running process by taking into consideration these factors. By designing the pallet that works best in your shipping department, holds the weight of the product, best protects your goods and meets delivery specifications, you ensure the safe delivery of any product. Read: How to prepare freight shipments, via UPS. Regulations, taxes, tariffs and fees for domestic and international shipping vary depending on the industry. These factors greatly impact the cost of goods shipped and the method of shipping and documentation required. Failing to comply with shipping regulations regarding pallet construction can cost your company a pretty penny. In fact, fines and penalties often negate the profitability of shipping. Delays caused by not meeting shipping specifications adds expense, as well. Custom built pallets offer companies the ability to meet specifications for both domestic and international shipping. These pallets can save you the cost of fines and penalties associated with non-compliance. Plus, custom skids improve the likelihood of products reaching your customer without unnecessary delays. Using the wrong skid costs you valuable dollars and may even overtake any potential profit. Pallet replacement, product damage, customer returns because of storage issues and workers compensation claims due to faulty and ill-fitting skids add up quickly. Purchasing standard pallets increases the likelihood of paying for more packaging than needed. When a pallet supports a product sufficiently, less packaging and equipment (and thereby, cost) are needed around the load. Plus, the environmental impact of your company is reduced. The cost-efficiency of custom pallet designs reveals itself in the life of the skid. Built specifically to handle your product, the life of the pallet is extended. Your product is better protected and, therefore, costs are reduced due to lost or damage products. Finally, safe transport leads to less injuries to warehouse and delivery workers as well as your customers. As you begin to plan out your perfect pallet, pallet experts like Direct Supply offer professional design advice. With our knowledge and expertise, you may be surprised just how easily the design unfolds. Where will the skids be stored? What customer or shipping specifications do you need to meet? Are pallets returned to you after shipping? Will you reuse the pallets? How much do you plan to reuse them? Get to know your product. Recommend the design, materials and style of pallet. Build the ideal solution for you. With your approval, a pallet which offers the utmost product protection and packaging integrity (without overkill) will be built. Your ideal solution will soon arrive on your warehouse doorstep. In three easy steps, your company benefits from the advantages of custom built pallets. Contact Direct Supply today to learn specifically how to put custom wood pallets to work for you.